Hello! I was going to post this last night but I was too tired. I barely know how I managed to bake these buns but I did. 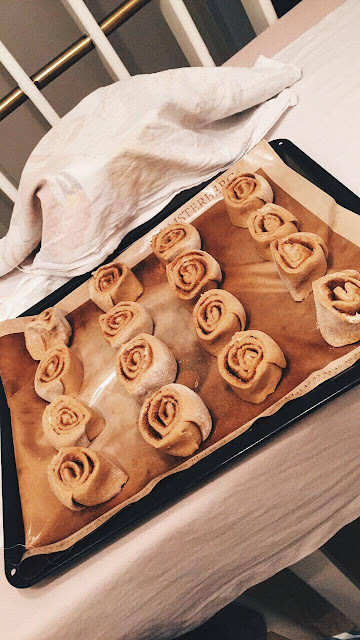 Okay, so a few weeks ago I saw this picture on instagram of these delicious looking vegan pumpkin spice cinnamon buns. Immediately I just knew that I had to make them. Last night I finally decided to fight my fatigue and bake them. I even made my own pumpkin spice pumpkin puré (because you know I make everything from scratch). It was very easy. As you can see I made twice as many buns as the recipe says, but you should still bake them for 25-30 minutes. I skipped the glazing on my buns. I have missed baking so much! When I was younger, before I started high school and even in high school I used to bake all of the time. Cookies, cakes and I even made my own ice cream. It was so much fun. Now I don't do that as much or I mean even at all. It's just that I don't really have the same craving for sweet stuff as I did back then. 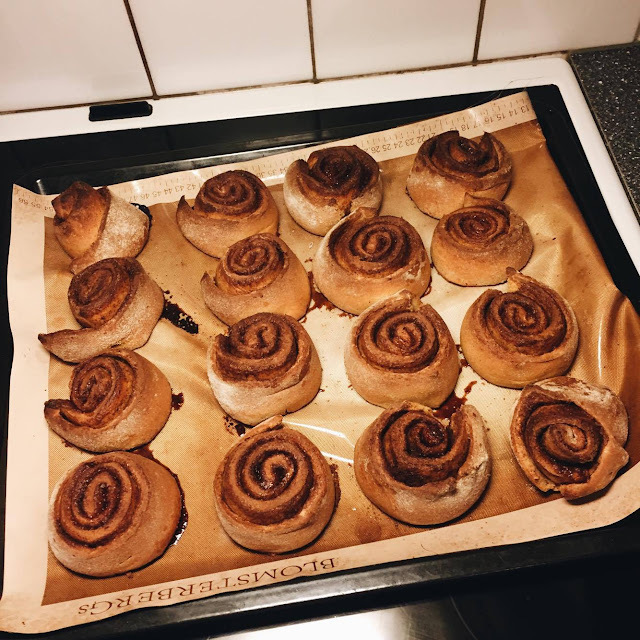 If you yourself is feeling a little like a master chef and want to make these buns yourself just click on the links below for the recipes. Recipes aka the recipe for the pumpkin puré, pumpkin spice spice mix and (the main thing) the vegan pumpkin spice cinnamon buns. All recipes are very easy to follow so I am sure that you won't have a problem making them! Note: To make the pumpkin cool faster after its been in the oven I just put it out on the balcony.